← What does it say about me that the object I loved most at Sage Farm was . . . a vintage air compressor? 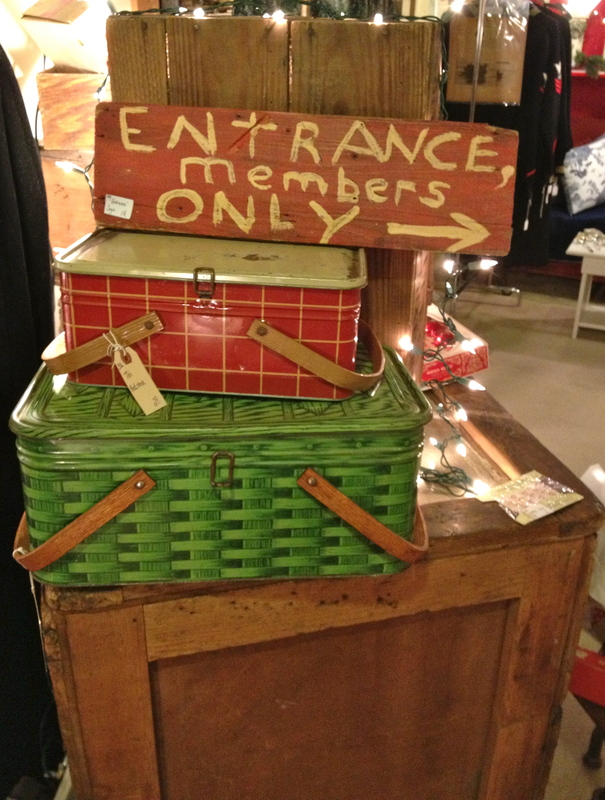 This way to the secret clubhouse! Don’t forget to bring a picnic lunch. 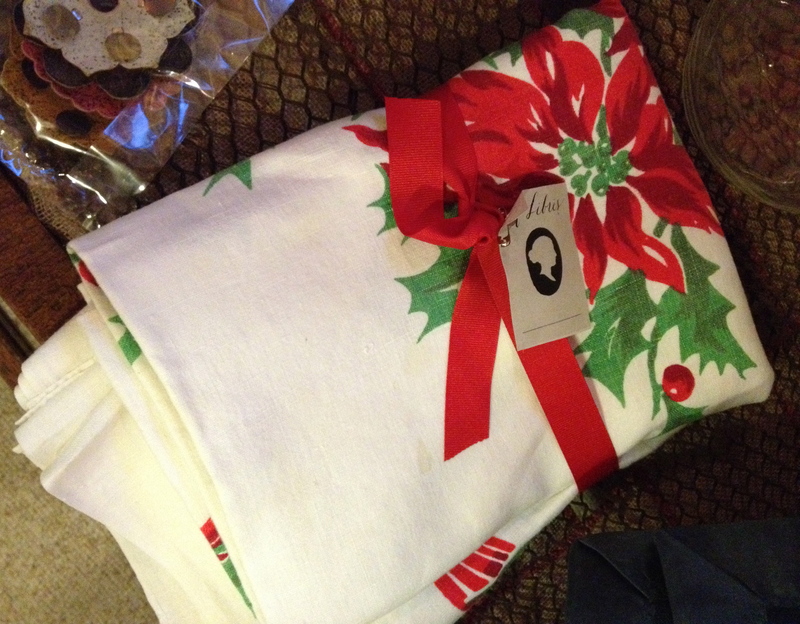 A gorgeous linen tablecloth with poinsettias and holly. A buyer snagged it right after I snapped the photo. Darn. 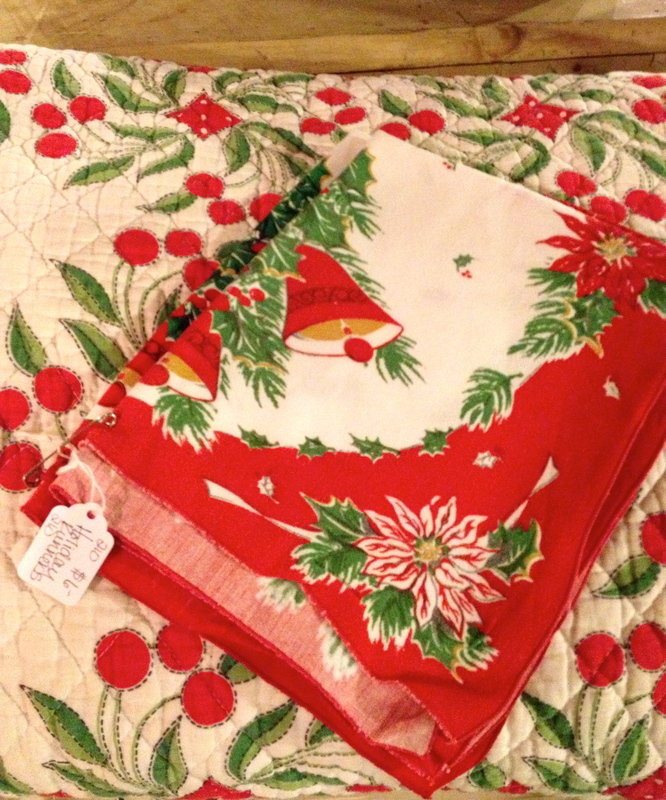 A Christmas towel or table runner. It’s layered on top of a nifty printed quilt with cherries—not strictly holiday but the colors are just perfect. 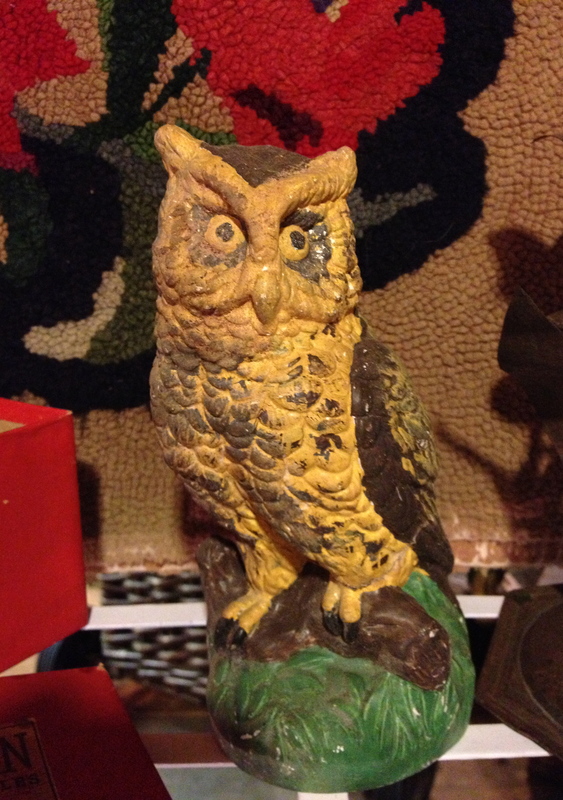 Who-oo-oo says you can’t decorate for the holidays with a startled-looking owl? He’s perched in front of a vintage wool hand-hooked rug. 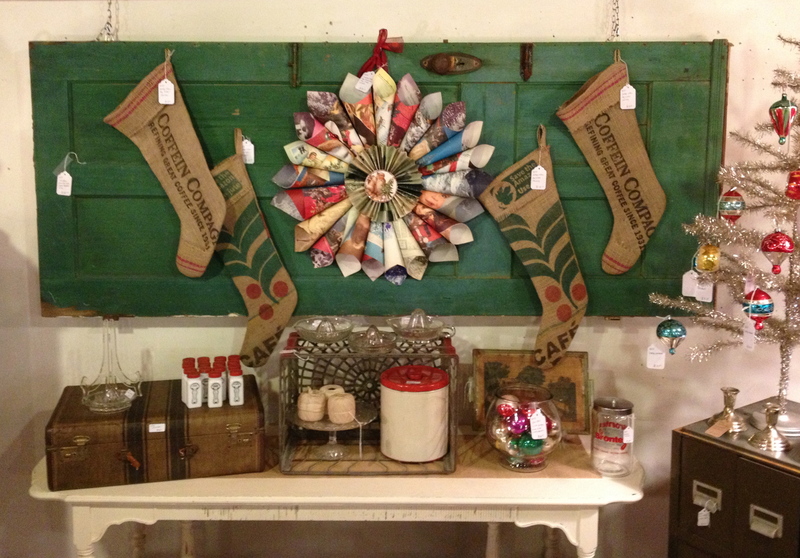 A cute white & red shelf made from one leaf of a enamel-top table. 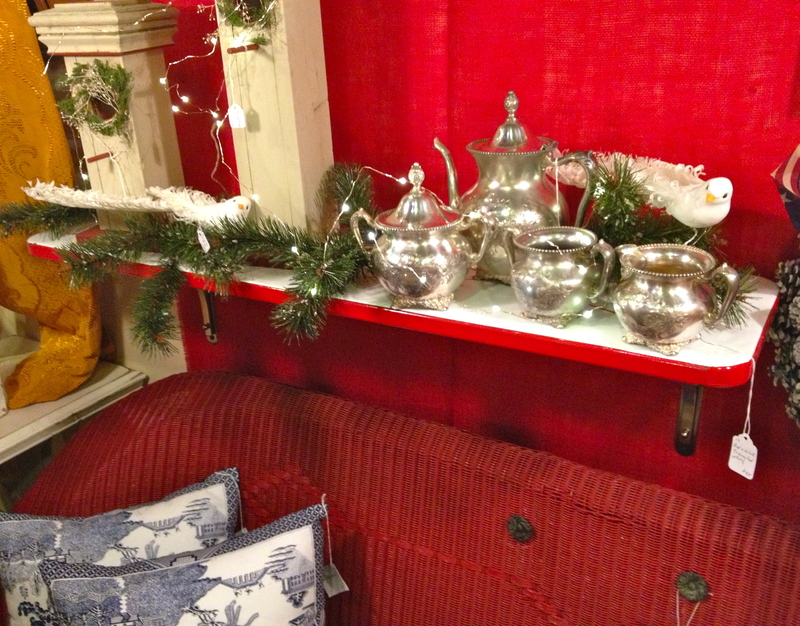 Style-perfect deco chrome brackets hold it to the wall, and there’s a bright red wicker settee underneath. Doesn’t the silver sparkle? I tried to talk Janeray into putting this shelf in her kitchen but she wasn’t biting. 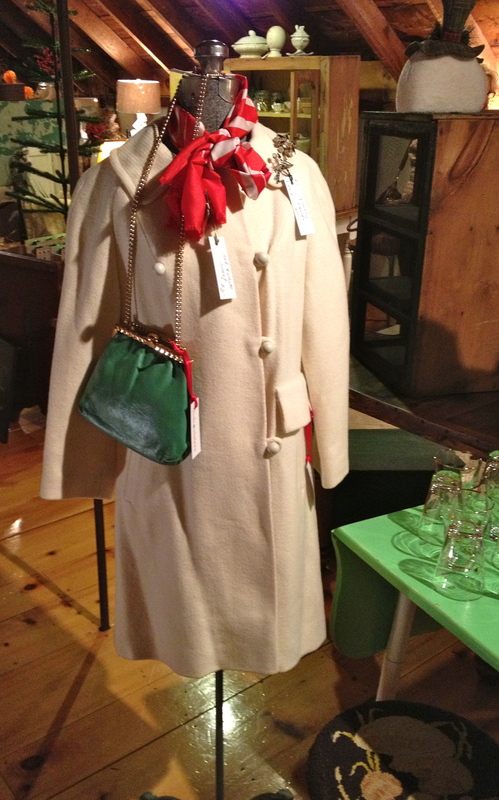 The nicest vintage white wool-twill coat, spiffed up with bright accents. This was in the Dishsisters booth, right out front, and I really liked how it came together. Someone else must have thought so, too, because the coat sold on the second day of the show. 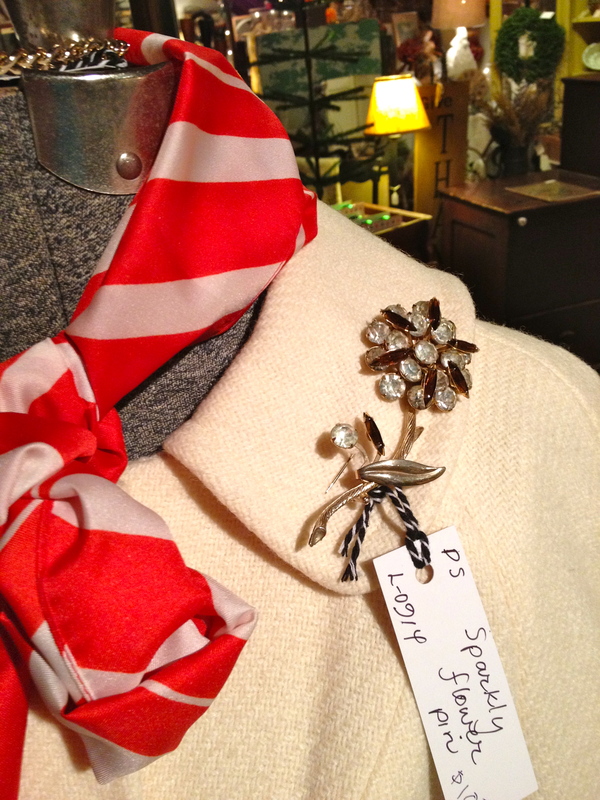 I’d added a striped silk scarf, and a sparkly pin . 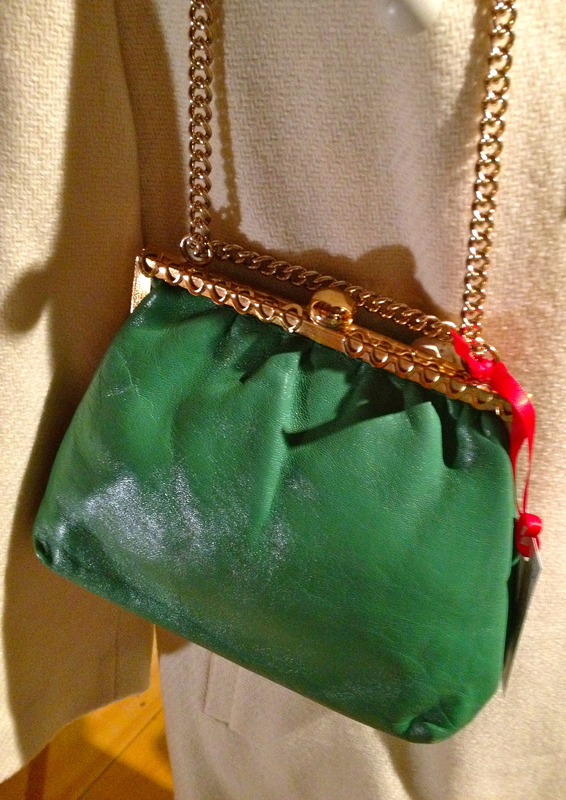 . .
and a vintage Jane Shilton purse in glossy green leather. Made in England! Somebody talk me out of keeping this, please. 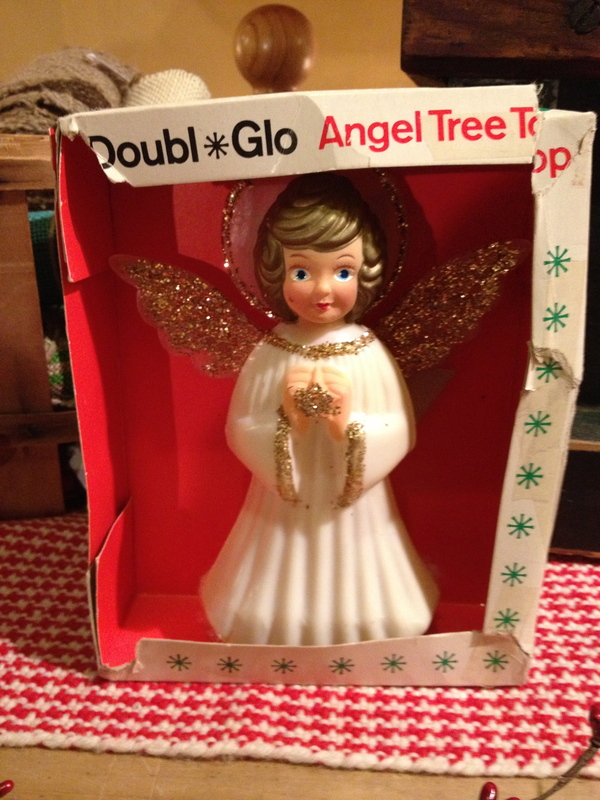 One more—a wide-eyed little tree-topper liberally sprinkled with glitter. Stay tuned for more photos from Sage Farm! But . . . but. . . that’s only two weeks away! Keep the purse; it’s awesome! I’m trying to discern what the wreath against the green door is made of. I thought at first it was old ties. Zoomig in..maybe paper cones? Whatever–it looks great,a s do all your displays! Pam, I think they were heavy paper cones, maybe pages taken from vintage Christmas annual magazines like “Ideals,” the ones that are about 11″ x 17″. It was in another dealer’s booth, not ours, so I’m not sure. Only the white coat on the tailor’s mannequin is ours. But I do love to snap photos of everybody’s great displays! Love your displays! I bought a vintage white Nordstrums cashmere coat at Goodwill for $10.99 that looks a lot like the one in your picture. Merry Christmas! White cashmere! Oooooh! You lucky lady! Send us a photo!